Are you interested in gardening and need a cure for those winter blues? 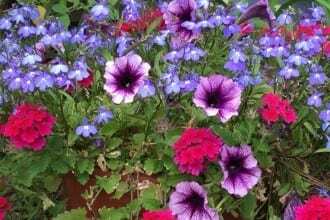 Start planning your spring garden now with the Library Garden Series presented by NC State Extension’s Dare County Master Gardeners at the Dare County Library in Kill Devil Hills and at the Fessenden Center in Buxton. All programs at the Kill Devil Hills Library will take place Wednesdays at 11 a.m. and all programs at the Fessenden Center, on Tuesdays at 1 p.m. Presentations will last approximately one hour and participants may choose to attend one or all of the programs that are of interest to them. We hope you will kick off 2019 by joining us for fresh, unprecedented programs, as well as some of our most popular topics from years past. Plants That Survive and Thrive on the Outer Banks: New Selections, will highlight plants that Master Gardeners have found to survive and thrive through all the challenges Outer Banks weather gives them. Plants highlighted are Gaillardia, Okra, Verbena, Narcissus, Viburnum, Fatsia, Yaupon Holly & Crape Myrtle. This program will be presented on Wednesday, Jan. 30 at 11:00 a.m. at the Kill Devil Hills Library. Xeriscaping will teach you how to change the way you garden by learning how to use less water, grouping plants with similar needs together, mulching, and reducing lawn areas. Join us for Xeriscaping on Tuesday, Feb. 12 at the Fessenden Center in Buxton at 1 p.m. or on Wednesday, Feb. 13 at the Kill Devil Hills Library at 11 a.m. Flowers come and go, but foliage plants provide long-lasting color throughout the seasons. Learn more about using foliage plants in your landscape in an original program, Color Without Flowers: Foliage Takes the Stage. This program will be presented at the Kill Devil Hills Library on Wednesday, Feb. 27 at 11 a.m. Gardening tools can be expensive. However, there are tips and tricks to learn how to care for your garden tools and methods for keeping them in good working condition. The program, Garden Tool Sharpening will provide this money saving information on Tuesday, March 12 at the Fessenden Center in Buxton at 1 p.m. and on Wednesday, March 13 at the Kill Devil Hills Library at 11 a.m.
Speaker’s Bureau and are made possible in part by a grant from the Outer Banks Community Foundation. All programs are free and open to the public and reservations are not required. For more information, please call the Dare County Library in Kill Devil Hills at 441-4331, the Hatteras Library at 986-2385, or stop by the Kill Devil Hills Library, Hatteras Library or Fessenden Center to pick up a program brochure. The presentation schedule and more about the Dare County Master Gardener program may be accessed on Dare County’s NC State Extension website at https://dare.ces.ncsu.edu/events/.